Through his teaching and through his influence, the great Bulgarian spiritual teacher Omraam Mikhael Aivanhov (1900 – 1986) opened the path of spirituality to countless individuals, bringing to humanity’s attention for the first time, the need to unite, to achieve on Earth, a large planetary society, a global brotherhood and sisterhood, based on a solar religion. The following is an unpublished excerpt from a lecture given by him more than sixty years ago, I myself had transcribed it from an original document and posted on my old site in January 2008. Towards the closing of this site, this text was taken and sometimes edited or modified on various blogs (which, by the way, none of the authors saw fit to cite the source…), but as disturbing news continues in the world around us, I decided to republish this today in its unedited, untouched original form. 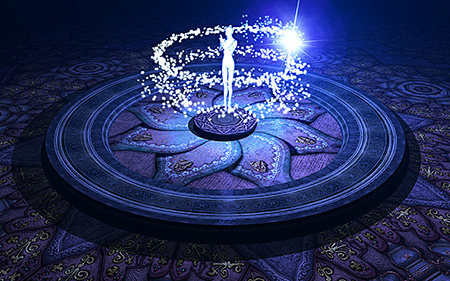 Everyone is of course free to assess whether or not the power of this wonderful message is important information on the mechanics of duality in our reality and the true structure of the spiritual world. The angels can only see what is light. They do not see us when we are in an “ordinary” form because they are blind to everything that does not belong to the world of Light, the spiritual world. In humans, all worlds coexist, but they are subject to the limitations, physics and laws of the physical plane. It is only when the world of feelings and emotions, boils and stirs in us, that the inhabitants of the astral plane begin to see us. And it is only when our mental body comes alive and becomes clear, when we begin to think that the inhabitants of the mental plane can understand us and relate to us. So if our spiritual bodies are not yet awake, beings in spiritual regions do not see us, they do not know us; we are not yet citizens of their world, we do not figure or appear on their records and we can receive neither nourishment nor any gift from them. Those who do not receive spiritual nourishment, joy nor happiness have irrefutable mathematical proof that they are in the dark, ignorant. If they stayed in the lower regions, clinging to money and material pleasures, they are cut off from the light, and as the inhabitants of the higher worlds have not noticed them, they did not help them, and they can’t receive anything sublime, heavenly or divine. As to be seen, known, registered somewhere in society, one must meet certain conditions. In the same way, to be seen, known and registered in the higher worlds, we must lead a determined life which requires us to be alert to subtleties. 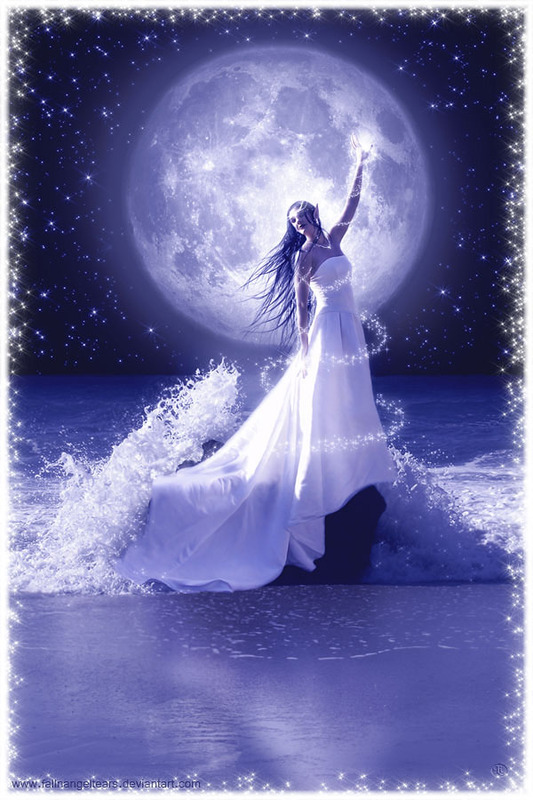 One can awaken these states through meditation, poetry, mystical music, thanks to all that is beautiful, bright, divine. Once awakened in us, these centers put us in communication with other worlds where those beings begin to “see” us, to take us into consideration. It takes our information, we have “registered” ourselves among the evolved beings. The work required in the awakening of these centers is to decide to become living, conscious, it is to accept and bind ourselves with all those benevolent beings who have passed before us and who seek to help us in taking the first step towards eternal life. The beings that inhabit the upper regions, do not see and do not want to see what happens in the lower regions. There is one exception: if they are charged with a mission of exploration, they go down to inquire, to discuss the situation or to help some people. In any other circumstances, they remain very high above human weaknesses and tribulations. Do not imagine that the Beings of Light will just stand there watching the sad spectacle of most humans on Earth! No, they are too far, too high, it is of no interest to them. So, in order to get their attention, to be seen by them, to be noticed, one must make signs, signals which must be projected into the space of light. These “light signals” by humans are like sparks, that sentinels in higher worlds, must be on the look-out for. Once they have been sighted, they rush in to help. Without this projection of Light, they are unable to see and, of course, all your requests will be ignored. Yes, dear brothers and sisters, remember this well: in the higher worlds, there is only one language; it is that of Light. And now, how do things operate in the world of demons? Demons are bothered by the Light. They flee and go to those dark, dirty places. They enter into them, and they set up their homes. I told you that demons were like the owls; Yes, because they are blind in the light. To enter us, they are forced to wait for an end to this terrible force which for them, is the light to the spirits of darkness, there is only one impregnable fortress: the Light . I speak constantly of Light, because it represents what is most valuable, the most important thing in Creation. This is the most sublime and rarest quintessence, the absolute protective and defensive weapon. This is “the strong force of all forces” mentioned by Hermes Trismegistus in the Emerald Tablet. Light is able to push out all your enemies and release them. When you pray or meditate, always seek the Light, the Light, and yet again the Light. You will avoid all the tragedies of life. Try. Never doubt. At night, if you hear a strange noise, what do you do? You hurry to turn on the light. Apart from the light, there is nothing else which you can rely on. To be seen by sublime beings, there is only one way: become bright, shine, like the Light. To escape the demons that harass you, there is only one way: become Light; they will be unable to harm you. Dark beings are harassed and bothered by the light of radiating souls, and seek to destroy it. They do not see that Light which troubles and disturbs them, they can only feel it. If they sometimes manage to see Light, it is by deceiving and using beings who are their superiors, to look through their eyes. Otherwise, they are unable to distinguish the Light. Besides, I told you that the converse also exists: that beings who inhabit the higher, purer planes of existence sometimes use the eyes of those who live below, animals for example, to observe us. Using this same tactic, inferior beings try to gain ground, to enter the human body and mind by using similar methods, to see, observe and interfere with realities which are above them. There is a great war between the inhabitants of the lower realities and those of the higher realities. In the physical world, when two countries are at war, each trying to send in camouflaged and well-trained spies. They adopt the language of the country they are sent into, mimic the behavior of its inhabitants, they are provided with papers and references and they know everything there is to know about their enemy. These spies see everything, watch everything and communicate to their superiors what they saw and heard. In addition, they seek to destroy and sabotage. And of course, it is mutual. This procedure is common and well known. But what is not generally known is that things operate exactly in the same way in the spiritual world between the White Lodge and the Black Lodge, at least with regard to the region of this Earth. No spyware can enter the upper regions where it would be immediately revealed. On Earth, in contrast, everything is mixed. Down here, the pure and the impure gets mixed up, the right and wrong, heaven and hell. There are well-camouflaged Black Lodge spies masquerading as disciples of love. They speak their language, they are dressed like spirits from above. They are wolves in sheep’s clothing. Case in point, founder and leader of the cult “Children of God, David Berg. And conversely, in places where the Black Lodge holds meetings to develop its projects, poisoning and and plotting the destruction of humanity, there are camouflaged members of the White Lodge, who pose as Black Lodge members and are equipped to sabotage and destroy their infernal plans. Under the appearance of wolves, they are in fact, gentle sheep. The Earth is a crossroads where white forces and dark forces intersect. No film, no play has ever presented accurately this terrible struggle. Should writers and directors ever decide to portray the extraordinary diplomacy, the arts and the rivalry of these two forces employ and wield against each other on the physical plane, all the better. It seems that nothing can separate them. For now, things are at this stage. So you’re probably wondering why doesn’t Cosmic Intelligence separate the dark forces from the forces of light? Why doesn’t it burn it out in a few seconds so that we can flourish in peace? Well, simply because Cosmic Intelligence has sublime patience and has plans to transform even the devils into angels. Whatever happens and whatever you external circumstances you find yourselves in, stay loyal to the White Lodge: if you find yourself one day grappling with beings who seek to lure you down, do not be afraid, link yourself the Great Universal Brotherhood and Sisterhood. Act as traitors in the eyes of the Black Lodge, but be better! Only in this way you can get out of your tribulations. Otherwise, your difficulties will last forever. All those who cut their link with the White Lodge, cut themselves off from the Source of life itself, eventually commit evil, injustice, crime. Sooner or later, they will find themselves in difficulties and complications. Tesla turned his back on the Black Lodge, many, many times. Before you accept or reject anything, everyone should be aware that all proposals are made to either contribute to projects which either “turn off” the Light, to destroy, to kill, to handle and manipulate according to the wishes of the Black Lodge. This can happen in countless forms and ways. All those who agree to work in this direction, unknowingly have signed a pact with the Black Lodge. Whatever their reputation in the eyes of the world, whatever image they manage to project of themselves, whether they be writers, artists, actors, patrons, scholars, scientists, workers or heads of state, all who decide to engage indiscriminately in the service of the Black Lodge, will find themselves bound by the Prince of this World. Once seduced, they fall into the trap and become his slaves. Scientific programs, political speeches and economic plans are often disguised as incentives to do evil. That is the only question you need to ask. The facts are all there, usually obvious. As soon as one has agreed to a pact with the Black Lodge, either for money, power, for a woman, for glory, fame or for fun, it is registered in the Black Book. In contrast, an apparently insignificant, selfless act can be enough to get you into the White Lodge, since it is inspired by a noble ideal. Work for evil and you will pay dearly for it. One day or another, misfortunes and disasters have always mercilessly visited those who have contributed to the increased presence of evil, creating dark projects. This is an absolute truth, whether we recognize it or not. J. Robert Oppenheimer, the father of the atom bomb. His life was full of triumph and tragedy. A disciple of the White Lodge is a conscious being who knows how to discern and distinguish the two forces, and learns how to master the dark forces, invert them in order to use them for the service of humanity, for the good. That is a true Magi! In conscious life, everything can be used for good, even the lower forces but do you know how? Light and prayer is the secret that can save you. When you love a person, look at them from afar with Light, don’t try to own them or control them. They will be happy without knowing why, and they will feel much better things. Disciples of the White Lodge must finally decide to use the Light, work with the Light. Those who refuse are not members of the White Lodge, as they insist on using other methods. What are we to do for those stubborn ones, those who have a “hard” head? Cosmic Intelligence in its mercy, always gives them time to change, to decide, to make an effort. But once the delay ends, there comes a time when you have to pay. There are Beings on high, who watch over our development, who will not allow any disruption to the advancement of the Great Universal White Brotherhood and Sisterhood, to Unity. Conversely, these inhabitants of the upper regions are delighted to see on Earth, here and there, homes and places of Light; this is their joy, it is their happiness. Small homes of Light are the link between the New Earth and the Earth as it is. Without these connections, without these centers, the Earth would be invaded and destroyed by the dark forces. These are the light centers scattered around the world who support the souls of men, give them food, joy, happiness. I will reveal what is actually a full initiatory center of life and light: it is the top of a mountain that links Earth to Heaven. You, the disciples of Light must succeed in forming together a luminous, gigantic pyramid, like that which rises above Agartha since time immemorial. Yes, because, the pyramids built by the Egyptians were made in the image of the Pyramid of Agartha, in the same way, above all sanctuaries, above all places where meditations, ceremonies and prayers are held, there is a similar pyramid formed by the subtle particles from the auras of the participants in these meetings. Soon you will understand. And your consciousness will expand and be enlightened. You will train and you will set up a pyramid that will be seen in many parts of the Universe. Outside of this Pyramid of Light, there is no salvation for humanity. The past few weeks I’ve been knee-deep in studying the history of occultism in the 20th century and it’s been quite an interesting and eye-opening read. Much of what we know and see today as either the New Age scene and the conspiracy theory scene actually have their roots in the various occult movements which were sweeping across Europe during the 1910s, 20s and 30s. Aleister Crowley is probably the best-known example of one of these occultists from this period but I don’t want to focus on him too much since he belonged to a Black Lodge and that’s not something I dig. Rather I want to focus on the White Lodges. My own theory is that after the horrors of WWI, interest in occultism literally exploded all over Europe because people couldn’t make sense of the violence they had witnessed or experienced and needed something which could help them come to terms with it. Europe was at the height of its culture, how could something so barbaric take place? This was a time when people did not understand mental illness as we do today, did not understand things like Post-Traumatic Stress Disorder and simply dismissed people as “mad” or shell-shocked. Groups like the Hermetic Order of the Golden Dawn, the Rosicrucians, the Theosophical Society, the Anthroposophical Society, the Thule Society, the Vril Society sprung up and blossomed all over the continent and by extension, in their colonies as well. Not that it helped very much because barely 30 years later, WWII broke out with even more horrific consequences but it definitely laid the theoretical groundwork for New Agers, hippies, occultists (both black and white) later on. The hippy and psychedelic movements did not come out of nowhere in the late 1960s. One occultist and psychic who interests me immensely is Dion Fortune. Not a lot of photographs of Dion Fortune exist. Born Violet Mary Firth, Fortune was a pre-eminent occultist, writer, psychologist, teacher and mystic who established the Society for Inner Light. She was also quite a pioneer in trans-personal psychology and was one of the first persons to introduce psycho-therapy and the teachings of Carl Jung and of the collective unconscious to Britain. She also incorporated these teachings with occultism, how certain personality types were susceptible to certain forms of hypnotism or psychic influence, something which was unheard of before. Fortune’s old house is the one on the middle with the giant fir tree behind it. Fortune had quite a storied life but one of the things which intrigues me most about her is how she lived at the bottom of Glastonbury Tor for many years. Her old house is now a magical bed and breakfast. Fortune was quite a prolific writer and for many years her books were out of print particularly her classic “Psychic Self-Defense” (a must-read in my humble opinion for anyone who is interested in the unseen world).Thankfully, her books are now being republished and there has been a resurgence of interest in her work, mostly because, I think, the stuff she wrote about are now being experienced by more and more people. A very, very interesting read. Because she lived at the base of the Tor for many years, the influence of that magical area no doubt exerted an influence on her. Fortune was convinced that the Tor and the Glastonbury area and countryside were intimately linked to the Arthurian legends, Merlin, the Holy Grail, the vale of Avalon, and that the Tor was the real, true heart of Britain and NOT the City of London, as the British Royal Family and British Establishment would like you to believe. Fortune also led an extraordinary early effort in mass psychic defense against psychic warfare. The seven ridges of the Tor are considered a mystery but to anyone with even a tiny amount of spiritual knowledge can instantly see that the Tor is like a giant stupa. The seven ridges representing the seven chakras and seven levels of consciousness and the top representing the kundalini being released to through the crown chakra. Full credit to the ancient inhabitants of Britain for representing such a spiritual concept into the land itself which not even the the introduction of Christianity could eradicate. ” It is a symbolic, collective entity formed in the Invisible World by the collective thoughts and feelings of a country, religion or group representing the sum total of the will of the community. It is an autonomous psychic entity made up of, and influencing, the thoughts of a group of people. The symbiotic relationship between an egregore and its group has been compared to the more recent, non-occult concepts of the corporation (as a legal entity) and the meme.(Wikipedia). Nations and culture have specific Egregores (don’t ask me how they come up with it and who is on the selection committee because I don’t know) though I imagine they are not all that different from totem animals which Native tribes use to identify their various sub-tribes and clans. 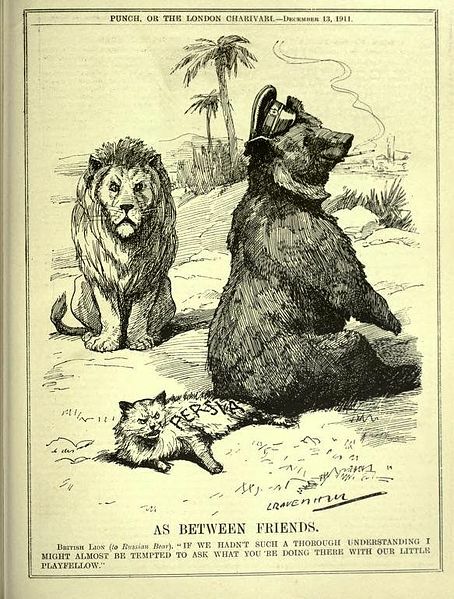 Russia’s Egregore is identified as a great Bear, India with the Bengal tiger, Japan with the Dragon, the US and Germany with the Eagle, Canada with the Beaver, France with the Rooster, Spain with the Bull, Turkey with the Wolf and Britain with the Lion. Each Egregore protects and helps the aggregate it belongs to and may even fight other Egregores. Aivanhov has written that the Egregore of the coming age will be one of peace, the Dove. I bring up the topic of Egregores because they played quite a key role in the Magical Battle of Britain and in no small part due to Dion Fortune. 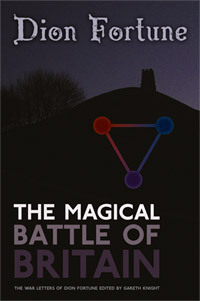 It’s a fascinating chapter in occult history and documented quite well in her book, “The Magical Battle for Britain”. Fortune knew on a psychic level that the Nazis were using black magick. The Rhineland was (and still is) full of occult groups and the stuff you saw in the early Indiana Jones films was not complete fiction and not entirely baseless. It would explain their meteoric rise and militaristic success in a mere 30 years from hyper-inflation, financial ruin and national shame right after defeat in WWI to suddenly becoming one of the most formidable armies in the world at the time. 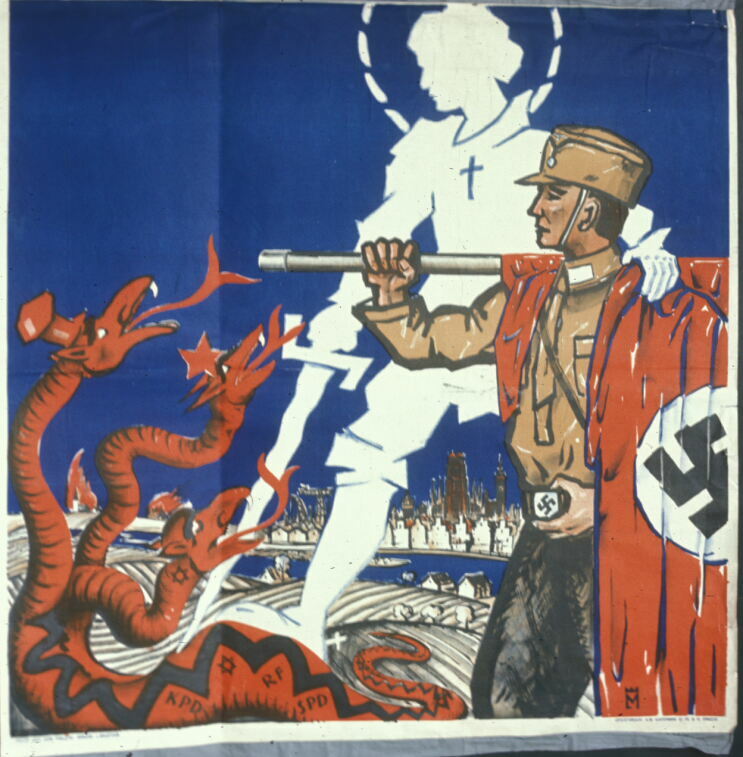 A typical German volkisch poster, complete with Christian and pagan symbolism. German secret societies were able to utilize German folk culture and mythology and have it as something the general German population could strongly identify with and rally around. This energized the German population immensely on many different levels, especially on the psychic one. Many upper level Nazi SS officers were deeply involved in these groups, particularly Heinrich Himmler and Hitler was not dismissive of them in the least. Fortune was convinced after watching newsreels of the Nuremberg rallies and his various speeches that Hitler had some mediumship capacity, that he wasn’t completely clueless on these matters. Fortune also understood that Britain and in particular, the Glastonbury area had to be protected at all costs psychically during the air bombings since it was (and still is) considered by many following the Western esoteric tradition to be an area representing the heart chakra of this Earth. 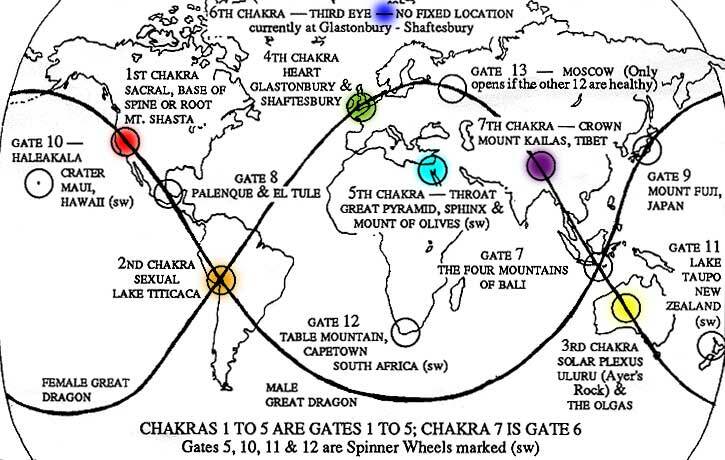 Map of Earth chakras. This is just one of many, many versions out there. To do so, she sent out weekly newsletters detailing a mass meditation of the week, with particular visualizations, particular prayers which were do take place at a particular time and apparently hundreds if not thousands of people volunteered to be a part of it. She led a cadre of meditators at the Society for Inner Light’s headquarters. The visualizations became more complicated over time but one of them was where she asked people to envisage giant, red-robed benevolent entities/beings along the coast of Britain, traversing across the land, giant Egregores of protection. Another visualization involved King Arthur and Glastonbury Tor. The German Luftwaffe never conquered Britain. A depiction of one of the visualizations. People might say that repeated experiments in mass meditation are flukes at best and delusions at worst but I would respectfully disagree. Fortune’s campaign was highly organized, focused, efficiently executed and methodically thought through. Most mass meditations I’ve seen or read about are nowhere nearly as organized, it’s usually willy-nilly all over the place, not disciplined in the least and quite disjointed and that’s why I think many of them don’t work. Targeted and aggressive marketing campaigns, cultural memes, clichés are all forms of repeating a certain idea over and over again until they become internalized. True, they exist in 3D reality, you can see it, touch it, point at it, but once it’s in your head, it’s in your head. So why can’t we create targeted aggressive marketing campaigns of our own with visuals and meanings and symbols of our own choosing towards positive and collective ends of our choice?